In April 2017, I hosted two Hidden Treasures Piano Salons. These are unique intimate gatherings of up to 10 people in my home studio. These impromptu Piano Salons were so fun that I plan to do them regularly. If you are interested in attending one of my scheduled Piano Salons, check out the “LIVE” page to see if I have any scheduled. My primary method for notifying interested people is by text. If you want to get first dibs on an upcoming Piano Salon, contact me at Craig@UnderThePiano.ca and provide me with a mobile number to which I can text message an invitation. Do not provide me with a landline number. A client recently booked one to celebrate his birthday with his friends. An incredible way to get connected with people you love and share an experience they will never forget. You can purchase your Piano Salon over in the STORE but you will want to contact me first to discuss dates and logistics. 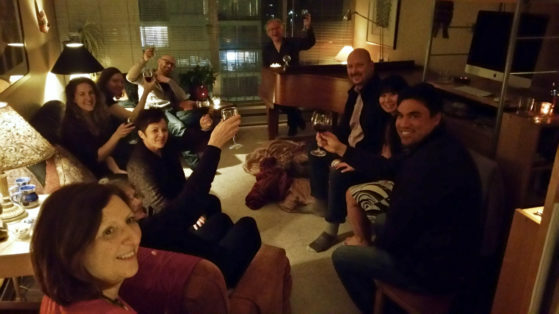 To receive invitations to my scheduled Hidden Treasures Piano Salons, text or email your mobile phone number to 604-662-3053 or Craig@UnderThePiano.ca with a note saying you want to be added to my Piano Salon text invitation list. If you have a specific date and time in mind for your Piano Salon contact me first to confirm availability.